Introducing the real-world Moschino x The Sims Available on Moschino.com and Moschino Shops Saturday April 13. The pieces are getting released SOON, with more in-game announcements to come! Jeremy Scott and Moschino’s now legendary annual Coachella party is this Saturday night in the California desert. Ahead of the event they’ve released campaign images of their upcoming capsule collection with The Sims. 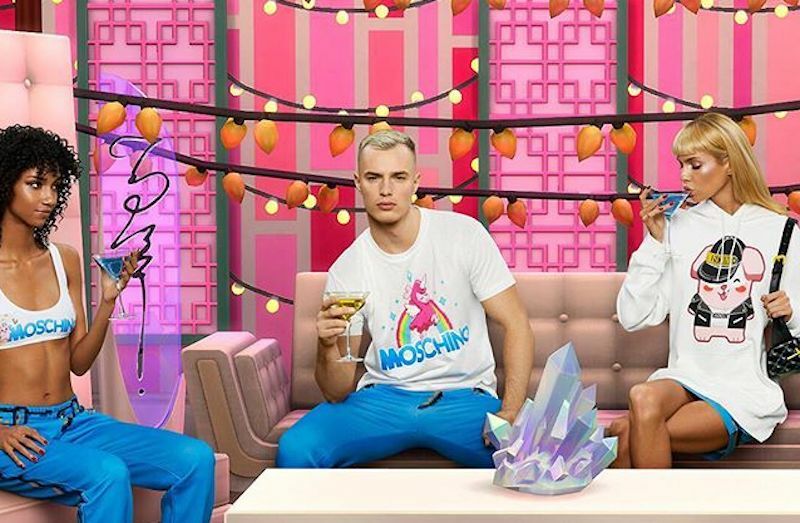 The life simulation video game franchise will be co-hosting this weekend’s party to toast their ready-to-wear and accessories collection, which cleverly features Moschino items with pixelated designs. Longtime Scott muse and Daily fave Stella Maxwell appears in the images (sporting bangs!) as well as the designer’s main squeeze Denek K and Aiden Curtiss. Is it just us or do you just want to jump into these images? The mods don iconic motifs from The Sims reimagined as Moschino Couture pieces such as a Plumbob bathing suit, a Freezer Bunny hoodie, and a Uni-Lama T-shirt.